Figure 7-23. - Tandem-type booster. In addition to hydraulic system problems, the brakes may fail to release as a result of a blocked passage in the power piston, a sticking air valve, or a broken air valve spring. Any malfunction occurring in the power booster will require removing the booster from the vehicle for repair or replacement. Some power boosters may be rebuilt or repaired; others are sealed and cannot be disassembled. Should you have any questions concerning repairs on the power brake system you are working on, consult the manufacturer's service manual for proper procedures to follow when testing or repairing a unit. The hydraulic-power booster, also called a hydroboost (fig. 7-24), is attached directly to the master cylinder and uses power steering pump pressure to assist the operator in applying the brake pedal. The hydraulic booster contains a spool valve that has an open center that controls the pump pressure as braking occurs. A lever assembly has control over the valve position and the boost piston provides the necessary force that operates the master cylinder. See figure 7-25 for a parts breakdown of a booster assembly. The hydroboost system has an accumulator built into the system. 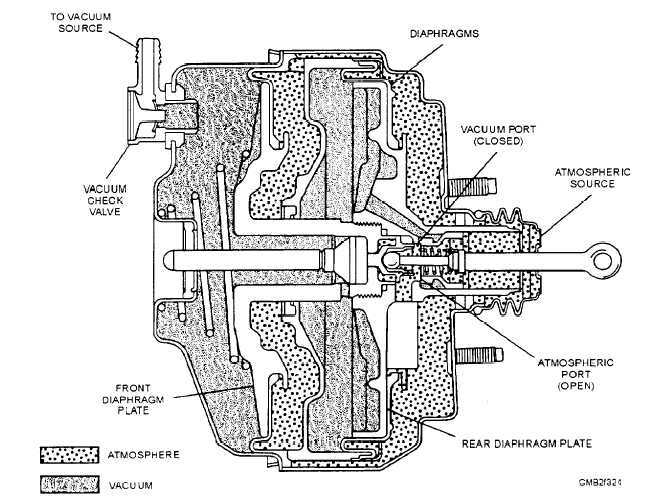 The accumulator, which is either spring-loaded or pressurized gas, is filled with fluid and pressurized whenever the brakes are applied. Should the power steering system fail because of lack of fluid or a broken belt, the accumulator will retain enough fluid and pressure for at least two brake applications. Parking/emergency brakes are essential to the safe operation of any piece of automotive or construction equipment. Parking brakes interconnected with service brakes are usually found on automotive vehicles (fig. 7-26). A foot pedal actuates this type of parking/emergency brake or a dash-mounted handle.